I have some big news… I’ve written the most amazing lunchbox eBook that is set to make your life a whole lot easier. It’s called A Healthy Lunchbox. This eBook is a fresh take on packing a lunchbox. It will see the 7a.m. rummage through the cupboards for suitable lunchbox fillers go. There are so many recipes you can create and either freeze ahead of time, or make in bulk to enjoy throughout the week. The best part? The whole family will love these allergy-friendly recipes, so hubby can take the same lunch as the kids. Now that’s the kind of lunch packing we all want to be doing! The recipes are really diverse. Think coconut crepes with blueberries, sweet potato muesli bars and egg, wheat and dairy-free crispy chicken strips. Oh and in case you were wondering, yes, the whole lunchbox is covered. I’ve also included the often forgotten lunchbox items like drinks. So there’s a host of ways to jazz up your water as well as smoothies that are meals in themselves. 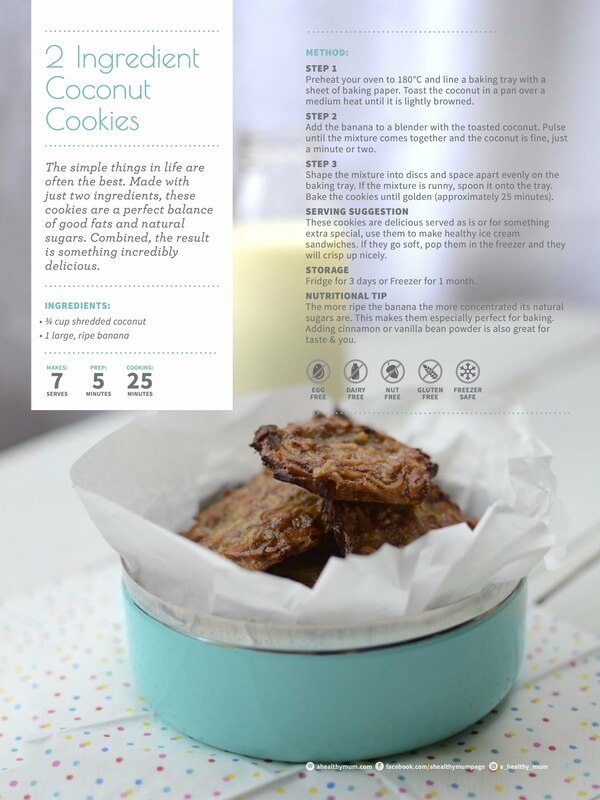 Here is just one of the 40 recipes in the eBook , it’s my 2 Ingredient Coconut Cookies.